Difficulty Notes: The partial Cautley Traverse is off trail hiking only. If you include Wonder Peak it might go up to 3rd class. I should mention up front, that I’m still not 100% sure if I summitted Ely’s Dome or not. Even though it’s listed on peakfinder.com, the location is a bit vague and open to interpretation. Based on the fact that folks seem to ski to the summit and the fact that the summit cairn was clearly “dome shaped”, I am going to assume I made the official, unofficial summit, but am open to correction. There was another higher point along the ridge to the east that I could not get to, that I was assuming was Cascade Rock at the time. This higher outlier is not a viable winter objective and the photos from the Ramblers page are not taken from it either. The traverse between Cautley and what I assume is Ely’s Dome was very straightforward. 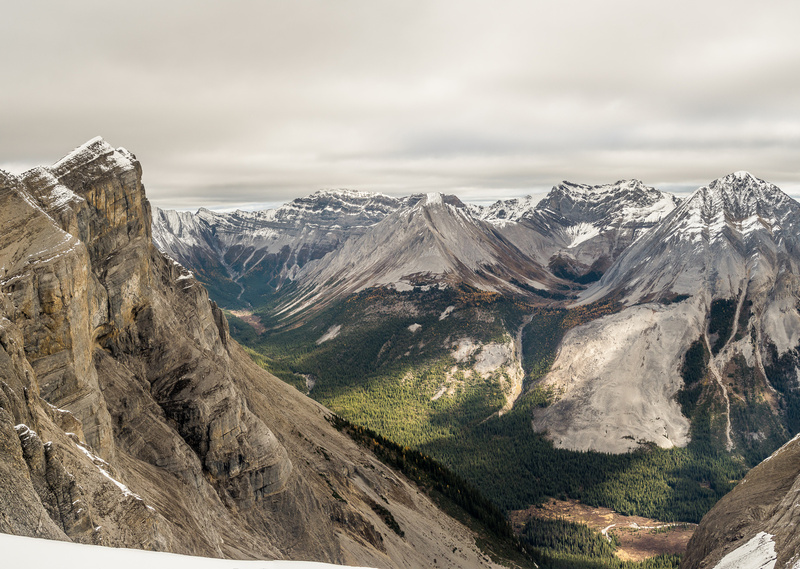 Most folks doing the Cautley Traverse probably don’t even bother with this small out-of-the-way bump along the ridge, but the views down Bryant Creek and over Marvel Lake were worth it IMHO. 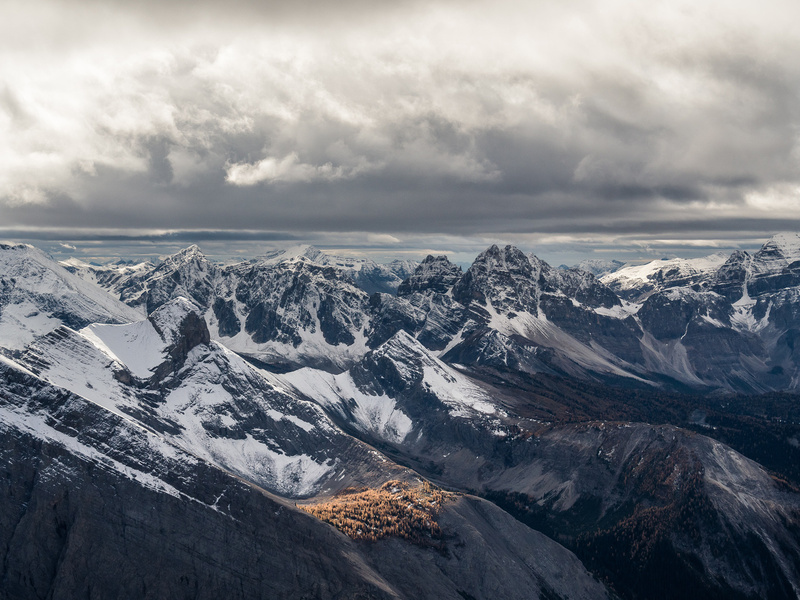 An island of brightly colored larches amongst a sea of grey, foreboding peaks. 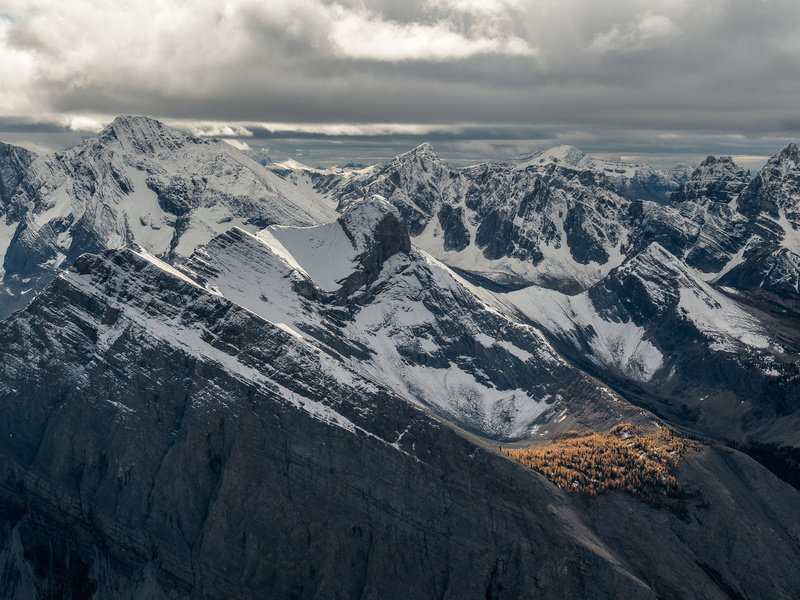 This is looking over Marvel Peak (C) towards the Blue Range and Mount Currie (L). 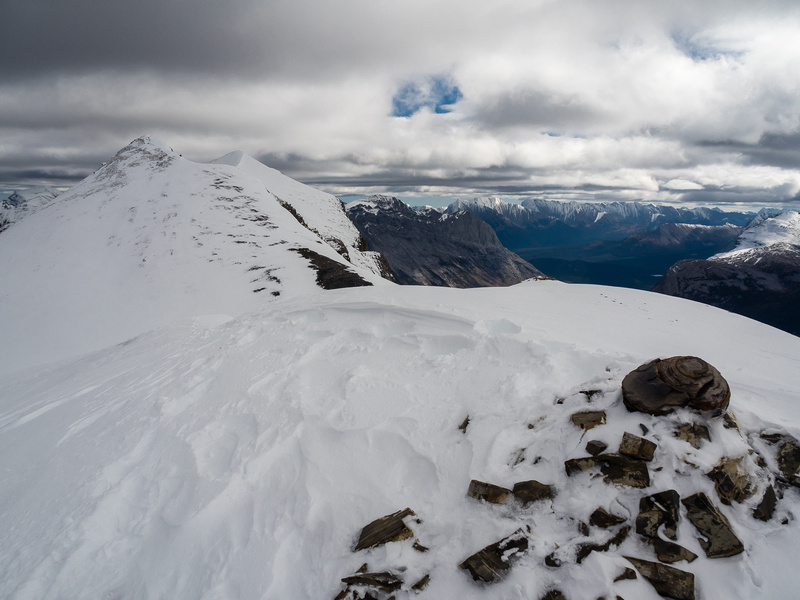 As I neared the summit of Ely’s Dome, I still wasn’t sure what was what. Due to my confusion on this particular day, I thought I had to traverse east from the dome to bag Cascade Rock. I soon realized that very similar terrain that had blocked my earlier attempt to traverse from Mount Cautley to Gibraltar Rock was going to block my traverse to “Cascade Rock” too. On hindsight I’m now glad I didn’t push the envelope on snowy / icy terrain for what probably isn’t a named summit at all! 😉 I do realize however, that I may have missed the official summit of the unofficial, Ely’s Dome, if it is the highest point to the east of where I made it. 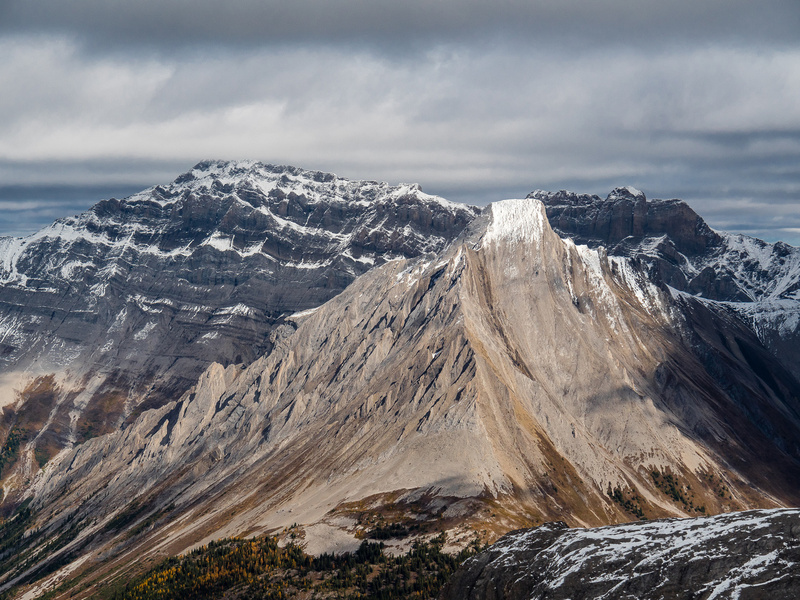 I snapped some pretty decent photos towards Mount Turner and Morrison and down the Bryant Creek valley before turning back towards Ely’s Dome and Wonder Peak. Looking over Marvel Lake towards an island of brightly colored larches among a sea of grey, foreboding peaks. 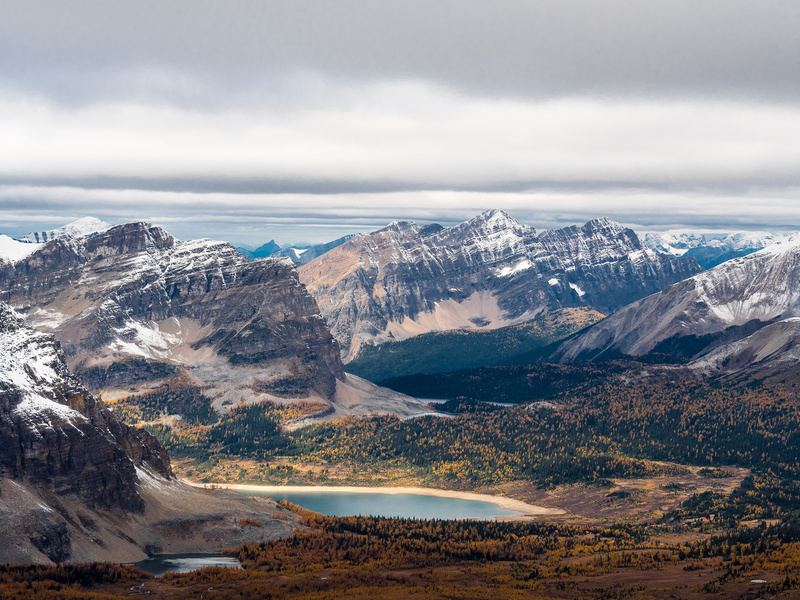 Another view over Marvel Lake towards Marvel Peak, Turner, Morrison and Currie. Looking north towards Cautley and Gibraltar Rock at left, Beersheba and Allenby at center. 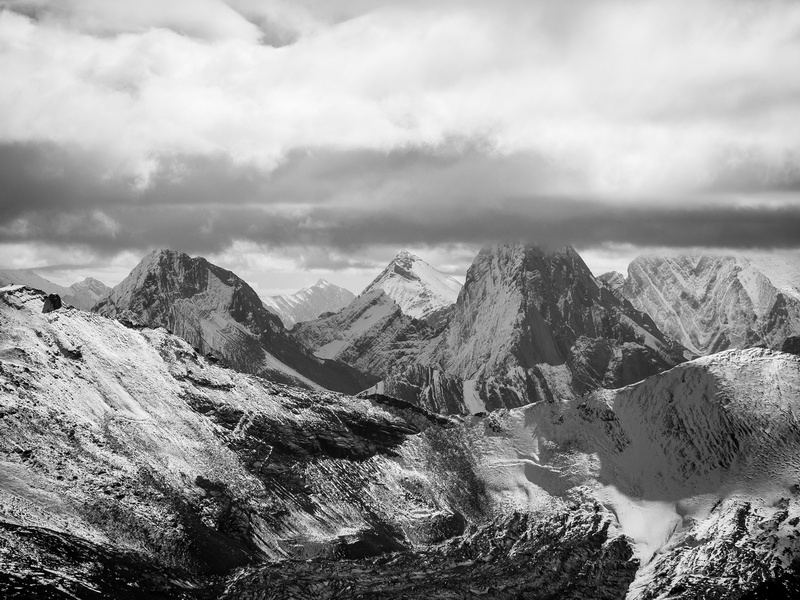 As I descended from Ely’s Dome towards Wonder Peak, I wondered (!) how the Cautley Traverse dealt with obvious cliff bands blocking easy access to Wonder Peak. Thanks to my foggy brain, I hadn’t read So’s trip report in as much detail as I should have or I would have known that there was a 3rd class route to climber’s right. I briefly thought about traversing the left cliff bands but considering the conditions and the simple fact that I’d already done Wonder Peak, I didn’t bother looking much harder and descended straight down to the Cautley Meadows from the Wonder / Ely’s Dome col. Ironically, on my way down I did briefly consider that the correct route to Wonder Peak probably went right where it does go. 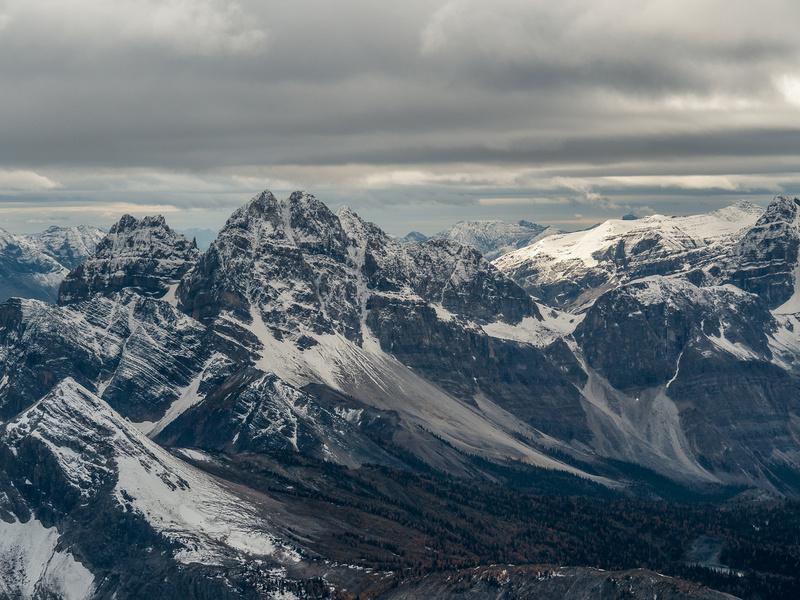 😉 The descent was easy and soon I was wandering towards the Wonder Pass trail and debating about adding The Towers to my day. I was feeling slightly miffed at missing both Gibraltar and Cascade Rock. A wonderful view of Gibraltar Rock at left and Beersheba / Allenby at right. 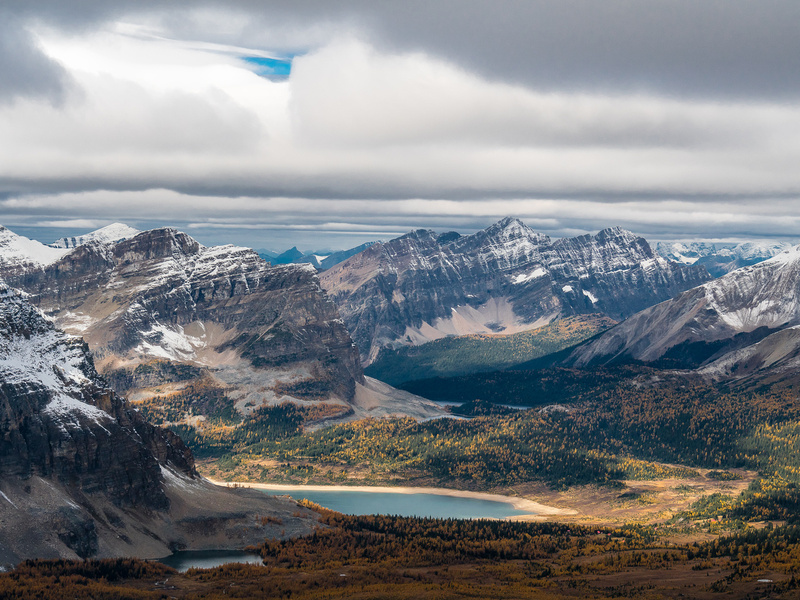 Assiniboine Meadows from near Ely's Dome towards Wonder Peak at left, Lake Magog at center and Cautley Peak at right. 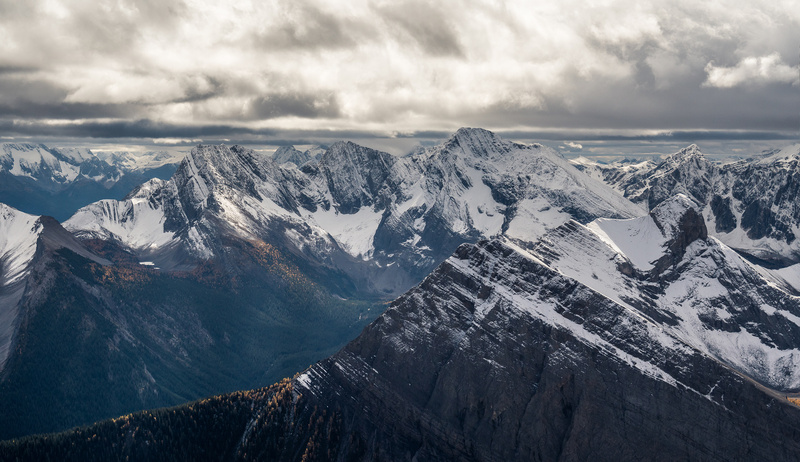 Telephoto looking towards Mount Shark and Birdwood in Kananaskis Country. Marvel Lake with Mount Turner and Morrison at left, Marvel directly across the lake and Aurora, Gloria, Eon, Aye and Wonder to the right. Cautley and Gibraltar Rock at left, Beersheba and Allenby at center and what I thought might be Cascade Rock at right. Pretty good views over Gog Lake (L) and Lake Magog past Sunburst Peaks (L) towards Indian Peak. Aurora Mountain doesn't look easy from here. 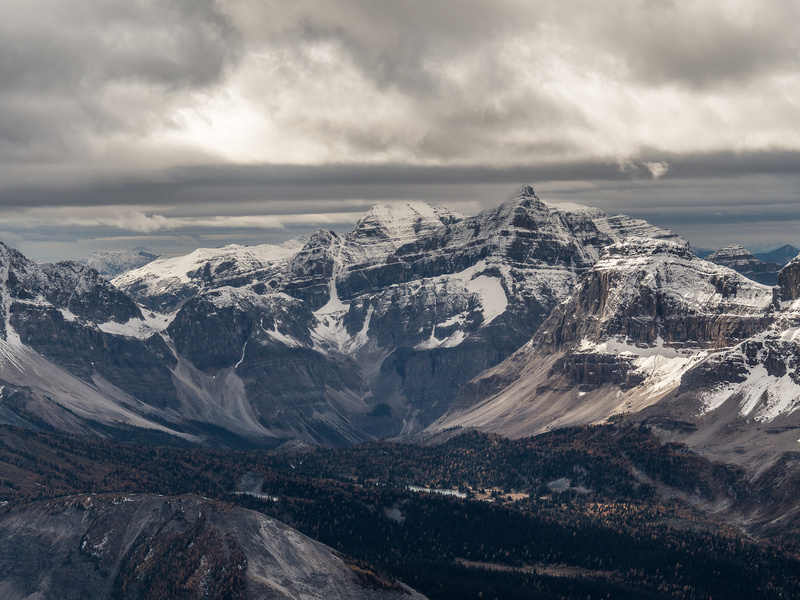 Marvel Peak in the foreground at right with Currie in the background. 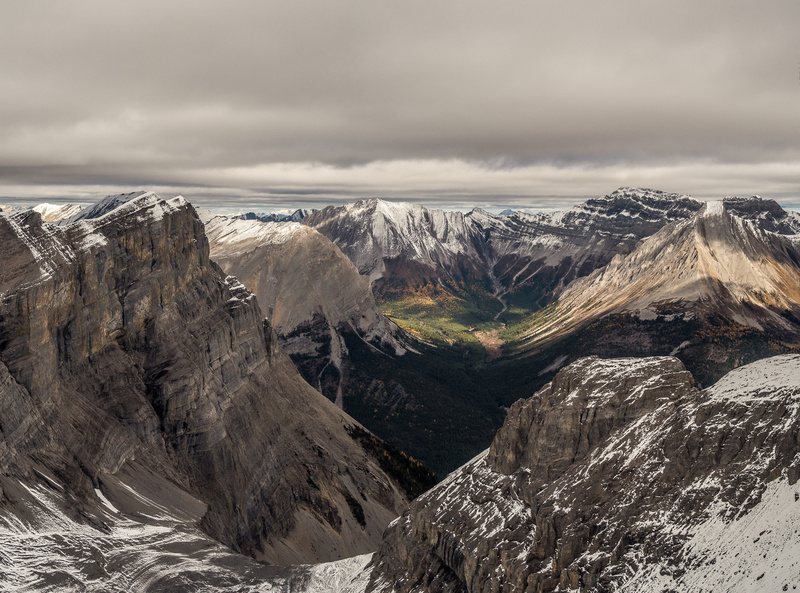 Looking towards Turner (C) and Morrison (R) with Tent Ridge, Shark, Smuts and Birdwood in the distance beyond. 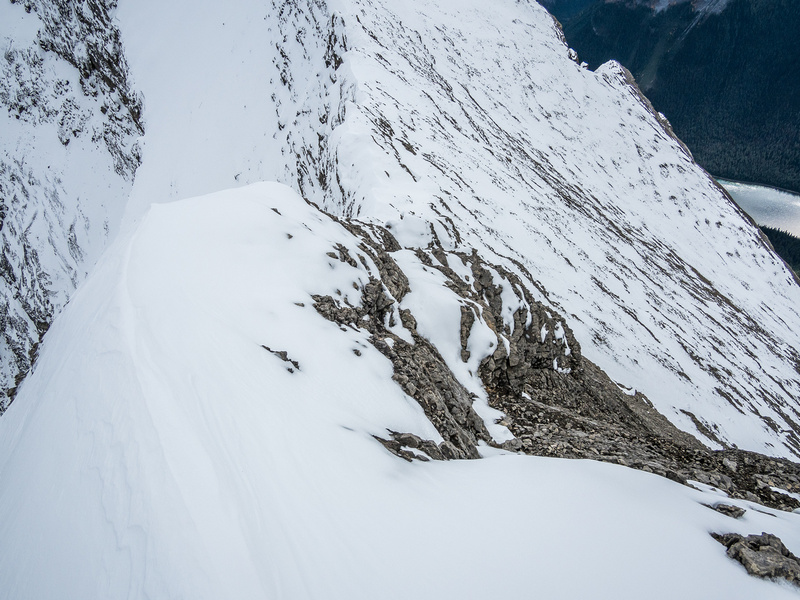 Pano of the east ridge at my turn-around point due to another exposed, snowy, icy drop-off. Cautley on the left and Marvel Lake on the right. Not worth it today... Looking down the drop-off that turned me around on the east ridge. Eon is buried in clouds. Looking across Marvel Lake towards Aurora (L) and Alcantara (R) in the distance. Looking north past Gibraltar Rock with part of Cave Mountain, Beersheba and Allenby to the right. Telephoto towards Indian Peak over Gog, Magog, Sunburst and Cerulean Lakes. Tent Ridge over Watridge Lake. 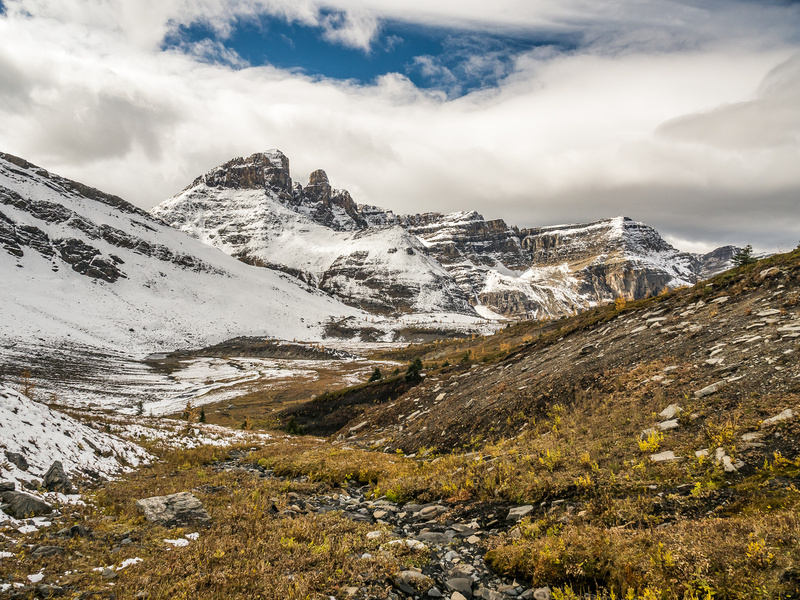 Panorama of the Assiniboine Meadows area looking towards Nub Peak (C) with Citadel and Fatigue in the distance and Cautley at right. 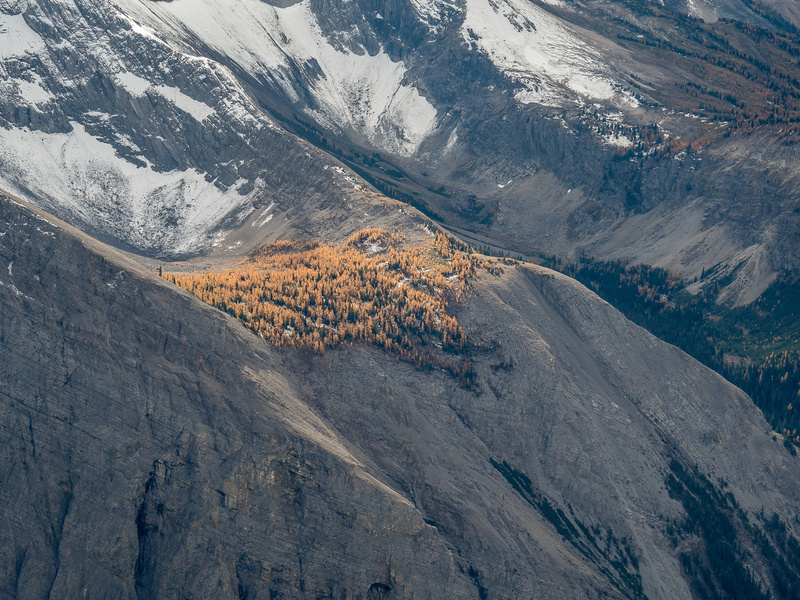 The larch island on Marvel Peak. 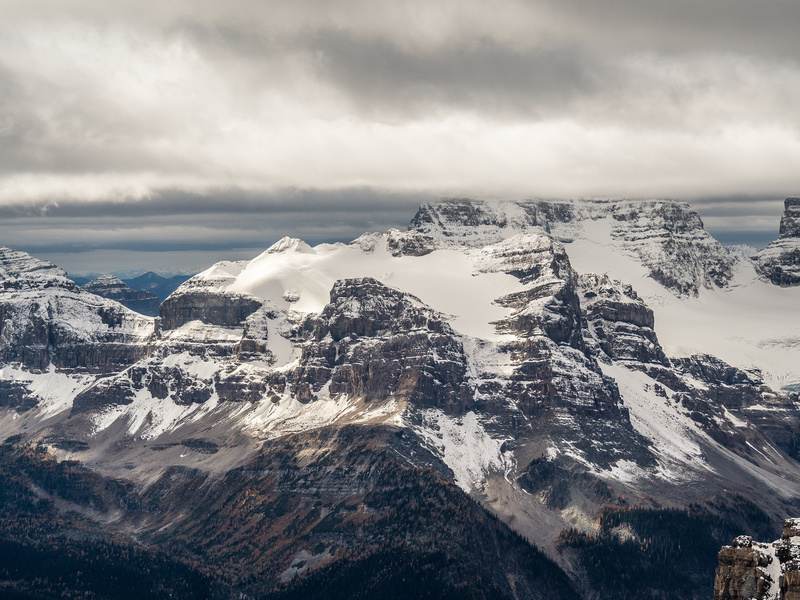 Brussilof (L) and Alcantara (C) rise over Marvel Pass and Mount Gloria (R). The distinctive Mount Allenby rises in front of Beersheba. 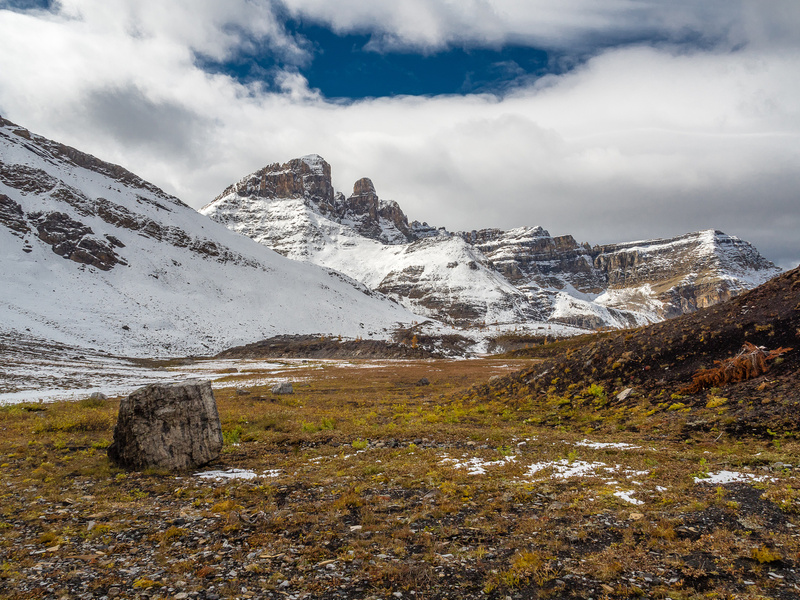 The summit of Ely's Dome included a dome shaped rock. I traversed further east to get to the higher point visible at left. 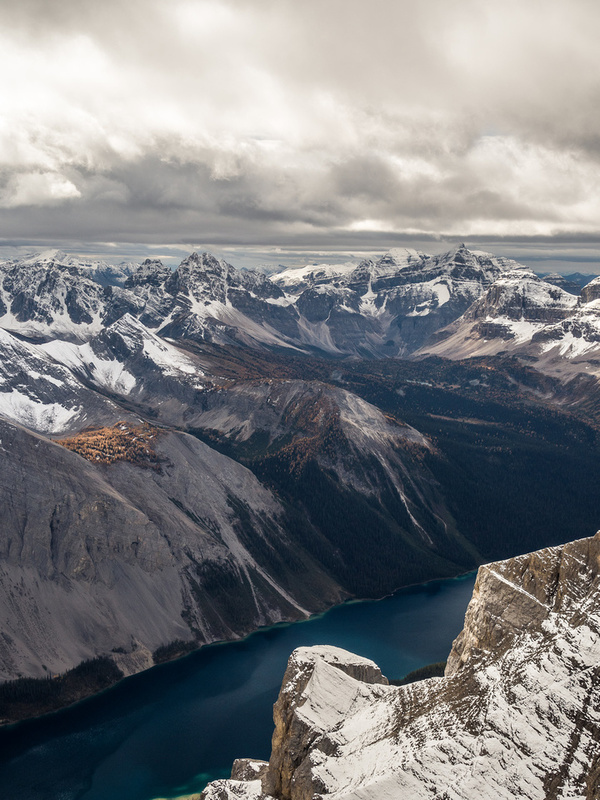 It's a pretty intimidating view of the cliff bands blocking easy access to Wonder Peak from the Ely's Dome col.
Great views down to Marvel Lake from the col. Ely's Dome at left out of sight and Wonder Peak at right, out of sight. Easy descent slopes to the meadows. Cautley at upper right, The Towers at left. 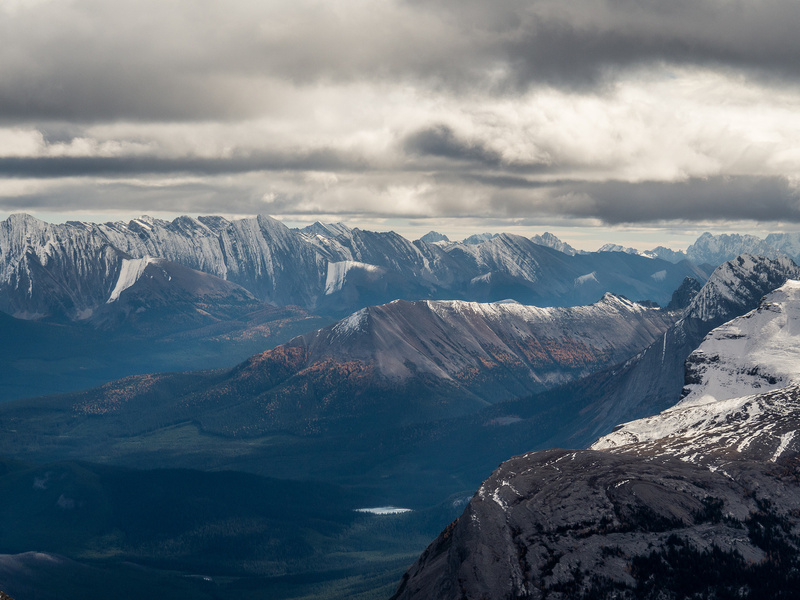 Looking over a shoulder of Wonder Peak towards The Towers.